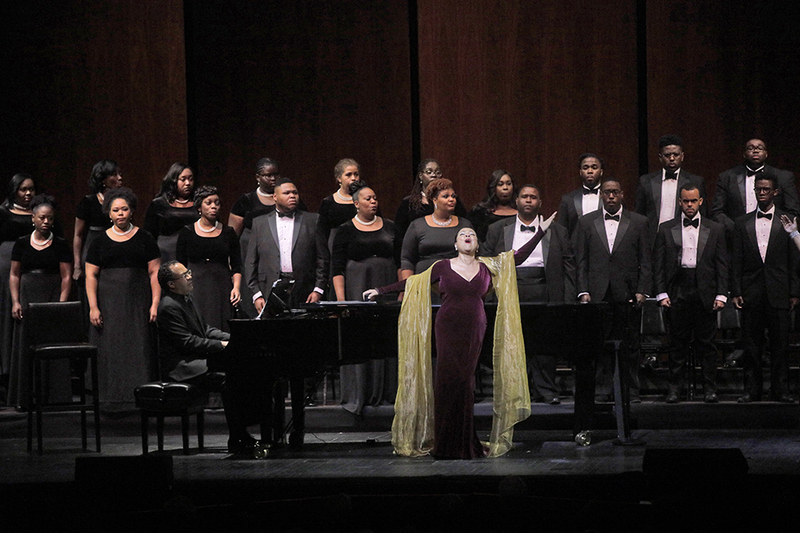 Five-time Grammy winner and opera star Kathleen Battle took the stage at California State University, Northridge's The Soraya along with pianist Joel Martin and the LA-based Albert McNeil Jubilee Singers. Actress Angela Bassett joined the trio as the narrator. File photo submitted by Ken Howard. Music Knows No Borders — the theme for the 2017-18 season at the Younes and Soraya Nazarian Center for the Performing Arts — rang true at opera star Kathleen Battle’s March 29 performance to a packed house at California State University, Northridge. The five-time Grammy winner drew audience members of different ages and from different backgrounds. The diversity was also visible on stage, as the choir had singers from different places in the world. Her piece, Kathleen Battle: Underground Railroad — A Spiritual Journey, featured numerous well-known spirituals, gospel and traditional pieces, including Wade in the Water, Roll Jordan Roll, I Don’t Feel No-Ways Tired and He’s Got the Whole World in His Hand. This season, Thor Steingraber, executive director of The Soraya, handpicked performances — including Battle’s — which explored the topics of migration and immigration. He picked Underground Railroad — A Spiritual Journey because of the unique experience of migrant slaves in America. “The beauty of music is that it doesn’t acknowledge the borders at all,” Steingraber said. “That is really, to me, ultimately what Music Knows No Borders means. It means that in many ways borders are just a concept that is manmade. The Soraya warmly welcomed Battle, whose performance brought together her cultural heritage and her musical background. Battle was accompanied by Oscar-nominated actress Angela Bassett, who is known for a wide range of roles including her performance as Tina Turner in the biopic What’s Love Got to Do With It and her recurring roles in the FX miniseries American Horror Story. Bassett narrated the performance by quoting renowned activists such as Frederick Douglass and Sojourner Truth. During her narration, the Golden Globe winner quoted activist Sojourner Truth’s famed Ain’t I a Woman speech. “Then that little man in black there, he says women can’t have as much rights as men, ’cause Christ wasn’t a woman! Where did your Christ come from? Where did your Christ come from? From God and a woman! Man had nothing to do with Him,” Bassett said, passionately. The audience laughed and cheered. “Obliged to you for hearing me, and now old Sojourner ain’t got nothing more to say,” Bassett concluded. Audience members got out of their seats and gave a loud ovation to the actress. One attendee, Pierce College student and hopeful CSUN attendee Selena Fuentes, said more than one aspect of the piece stood out to her. Pianist Joel Martin also joined Battle on stage — and performed electric solos on the piano. The Albert McNeil Jubilee Singers, an LA-based choir, also accompanied Battle and Martin. The trio had a noticeably unique dynamic, sharing the stage and the spotlight seamlessly.